Over the last four years, we've made Exploding Kittens, Bears vs Babies, and You've Got Crabs, and have sold more than 8 million total games. We make tabletop games because we think it's more fun to play with our friends than with our screens. Our newest game, Throw Throw Burrito, takes that idea one step further as the world's first dodgeball card game. We've learned a ton about game creation since 2015 and made all of the mistakes, so please ask us anything. How do you feel card games have changed with the rise of videogames? P.S. can Matt draw me a squid (as my username is squid50s)? Thank for very much for the awesome squid (with the 50 and ‘s’) drawing. It’s really cool that you’re taking drawing requests during an AMA; that was a great idea! Your semicolon usage is on point. I just want to say thank you for the games you have created. My daughter loves them and anxiously awaiting Throw Throw Burrito. she’s learning to draw in your style, do you have a words of saucy advice on creativity? P.S. Matt: Would you draw my daughter in your artistic style? Please and thank you. my daughter and her love for the upcoming game. What is the best thing you've ever drawn ? Our cat and family our big supporters of your games over the years. Elan: are their more games in the pipeline coming up? Matt: would you do us the honor and memorialize our cat Boots? If not he’ll make me wear the cone of shame. our master Boots eating breakfast. @Matthew, what is the MFing Pterodactyl here to do? Dodgeball card game? How does that work? Gimme some rules, I'm curious! Matthew - how do you come up with ideas to draw about, like the Mantis Shrimp? I place my head into the deep dark ocean and wait for the creatures to find me. I met Matt a few years ago at Beat The Blerch and he was beyond friendly. My friend and I mentioned we were Canadian and he chuckled at how many Canadians enjoy The Oatmeal and Beat The Blerch. Have you guys ever thought of doing “safe for Canadians” content? I have made a child cry by mentioning Exploding Kittens. I don't regret it. Matt can you draw me a pie? Would you ever consider doing a kickstarter exclusive expansion so you could draw anything even if it’s copyrighted? Matt-Please draw my chicken Yoda. He is a light brown and loves pecking people. I think we wants to take over the world. My family loves your game! Why exploding kittens (as opposed to exploding donkeys or penguins)? Matt, I'm training for my second marathon and remember your comic about ultra running. My question is, why do we do this to ourselves? Can you draw a cake for me because I miss sweets so much. 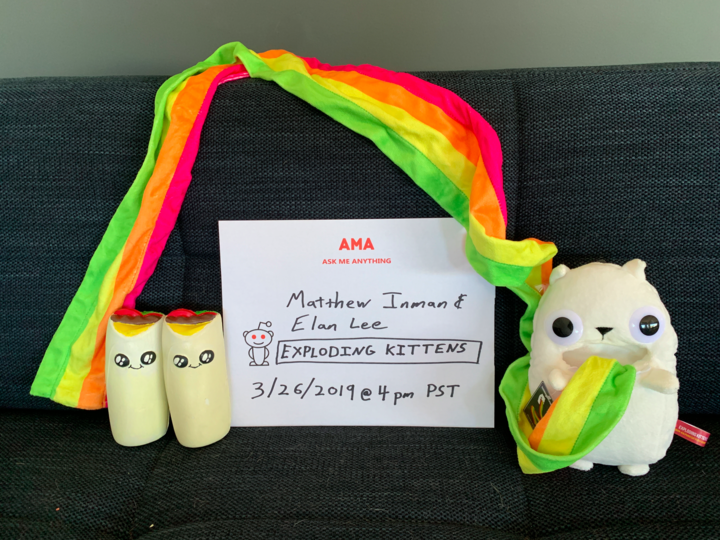 What do you like most about exploding kittens?